Jon Bon Jovi, a great American hero, is doing his bit for the government workers of New Jersey, who’ve gone unpaid as part of the government shutdown since December 22, 2018. 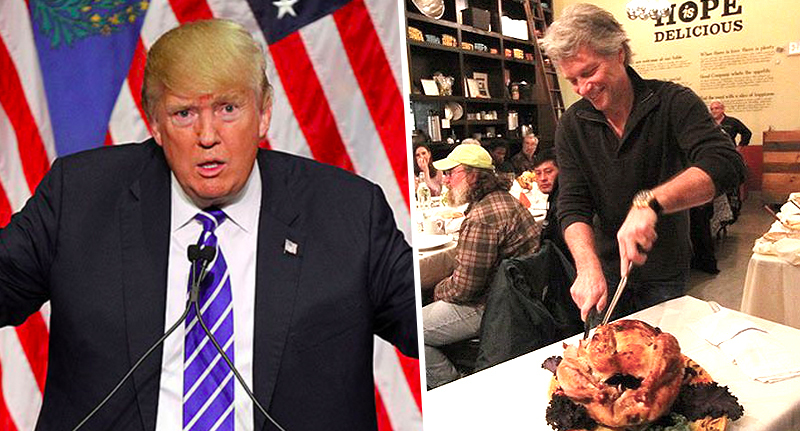 The Livin’ On A Prayer singer runs a community restaurant with his wife, Dorothea Bon Jovi, and they are preparing to give out free meals to all those affected by the three-ringed circus that is American politics today. In case our UK readers missed it – perhaps distracted by another political meltdown closer to home – the shutdown is the longest in US history, lasting nearly a month, all over a big wall. Meanwhile, some 800,000 federal workers – from firefighters, detectives, and correctional officers, to accountants, clerks, and janitors – remain unpaid. The remaining 420,000 are critical employees who’ve been working without pay since before Christmas when the shutdown began… And Jon, the owner of JBJ Soul Kitchen, just isn’t having it. Since founding the Soul Kitchen, we wanted to ensure that anyone struggling with food insecurity had a place to go. This Monday, we will be open for lunch as a way to create a place of support and resources for furloughed federal workers, many of whom are our friends and neighbours. JBJ Soul Kitchen is teaming up with the Murphy Family Foundation, a philanthropic organisation run by New Jersey Governor Phil Murphy and his wife, Tammy. We are thrilled to work together with Phil and Tammy Murphy on this endeavour, and this Monday we look forward to giving back in honour of Dr. Martin Luther King Jr. The Red Bank-based restaurant, which was opened in 2011, normally lets patrons pay a suggested donation or volunteer at the restaurant to pay for meals, according to its website. How many free meals they’ll be offering depends on the turnout, they added, and will be available from noon until 2pm. It’s all a part of the social consciousness motto. The schedule of additional meals will be determined by turnout, feedback and demand, and will be announced at a later date. Those wishing to participate should bring proof of federal employment. Although Congress passed a bill to reimburse federal exempt employees for lost wages once the shutdown ends, contract workers will not be reimbursed. Meanwhile, others have witnessed the distress the government shutdown is causing and sent pizza, while Cardi B took to Instagram to rant. On Saturday (January 19), President Trump offered a compromise of temporary protections for some undocumented immigrants in return for $5.7 billion in funding for his border wall. Looks like the one-man mission to build a barrier is still his main priority, and not the pay checks of his citizens.